Navicore/Wikimedia CommonsA meteor during the peak of the 2009 Leonid Meteor Shower. 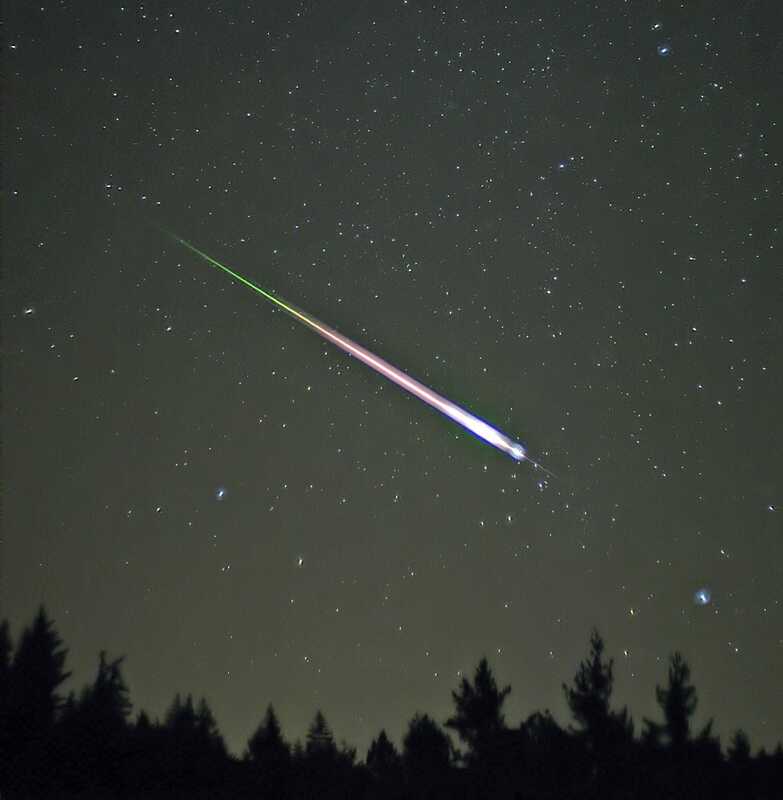 The photograph shows the meteor, afterglow, and wake as distinct components. November is the time of year to watch one of the most brilliant meteor showers of the year: the Leonid meteor shower, also known as the Leonids. The Leonids became famous during the 17th century for their impressive show of shooting stars. 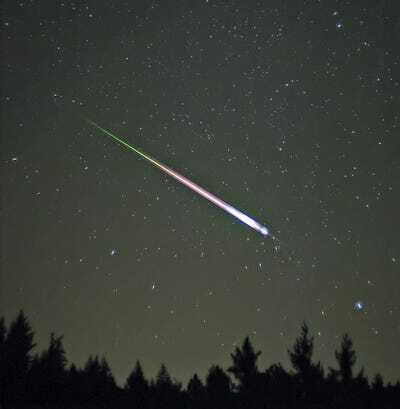 In 1833, for example, the most stunning part of the meteor shower displayed up to 100 thousand meteor per hour. This year’s Leonid meteor shower will not be as spectacular as the one in 1833, but reports suggest that it will still be a site worth seeing. 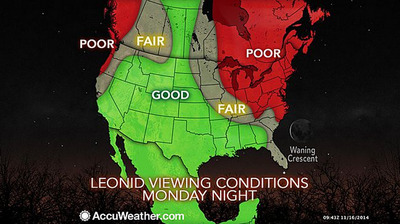 Also, the Leonids are one of the last meteor showers of the year. The Geminids meteor shower will follow in December. The best time to see the Leonids this year will be Nov. 17 and 18 between the hours of midnight and dawn. During those hours, observers can expect to see about 15 meteors per hour, or about one every 4 minutes. The best way to see a meteor shower is to get far away from city lights where you can clearly see the stars. To view the Leonids, astronomers suggest that viewers look at the part of the sky between the East horizon and the point right above to view the Leonids. 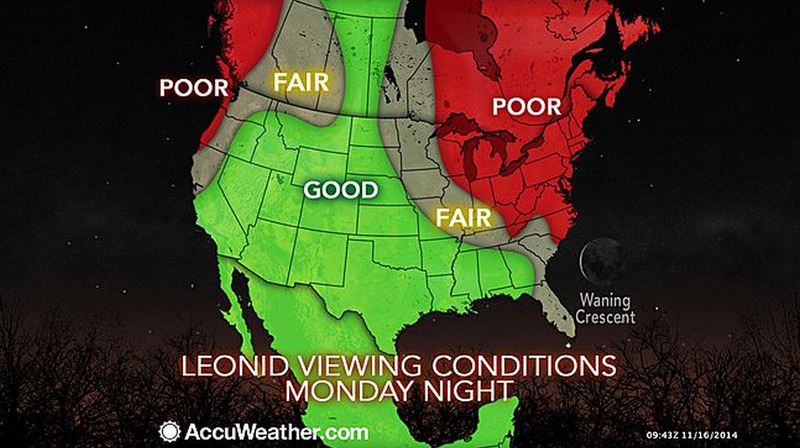 Below is a map from AccuWeather indicating where in the US that the weather is expected to provide clear skies for the best viewing. When Earth passes through the tail of comet Tempel-Tuttle, the dust and debris the comet leaves behind is swept up by Earth’s gravity. As a result, the debris strikes the Earth’s atmosphere at incredible speeds — for the Leonids it’s about 44 miles per second. At these speeds, the debris of the comet and the molecules in Earth’s atmosphere rub against each other creating tremendous friction. It’s this friction that generates heat and light that we then see as a “shooting star”. Each meteor shower is named for the constellation from which the falling meteors appear to emerge. The Leonids are named for the constellation Leo, which is Latin for lion. If you’re not in a good place to view the Leonids, you can still watch the show because the live online observatory, Slooh, will be streaming the event live (feed below) starting tomorrow, Monday, at 8 pm EST (5 pm PST).